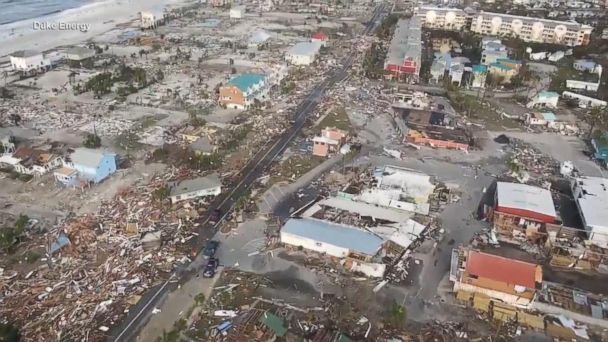 Follow the latest Hurricane Michael news, videos, and analysis from ABC News. Husband and wife who lost home in Hurricane Michael said that family is the only thing they want for Christmas this year. A man dubbed by the community as "Salvage Santa" helped launch a free toy drive so that all children in Panama City, Florida, can get a Christmas gift this year. 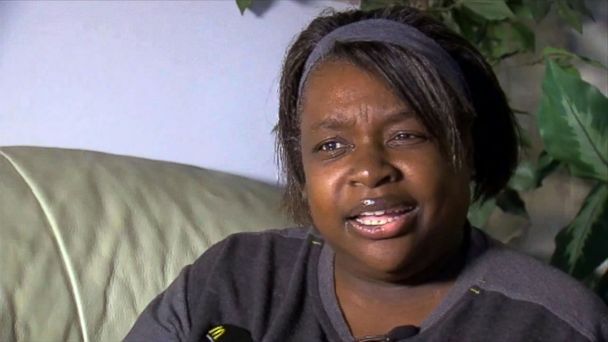 A woman was waiting for surgery at the hospital when she learned the plane carrying her long-awaited donor kidney had been grounded because of Hurricane Michael. Insurance industry experts project losses to range from $8-$11 billion. 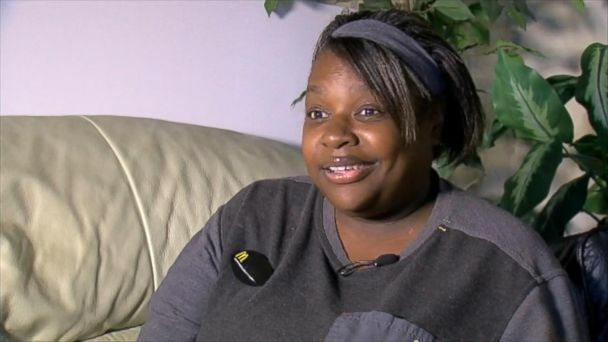 Angel Goss waited ten years for a donor match, which then spoiled as the ice keeping it cold melted on a flight canceled due to the hurricane. Food and water is still hard to come by in devastated areas of Florida. 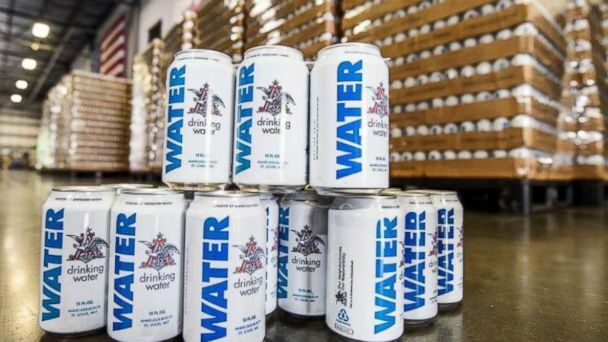 In 2017, the company send 3 million cans after natural disasters in Florida, Texas, Puerto Rico and California. 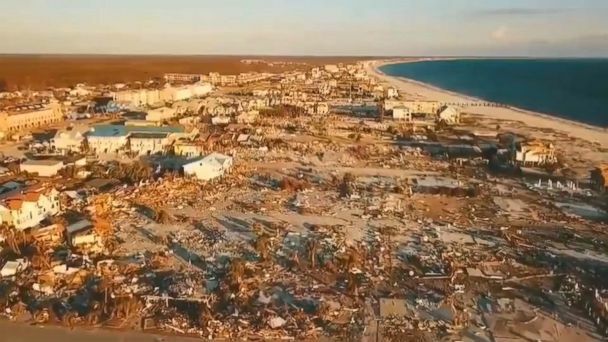 Officials in Bay County, Florida, said they'd completed 99 percent of their initial search and at least two deaths were in Mexico Beach. 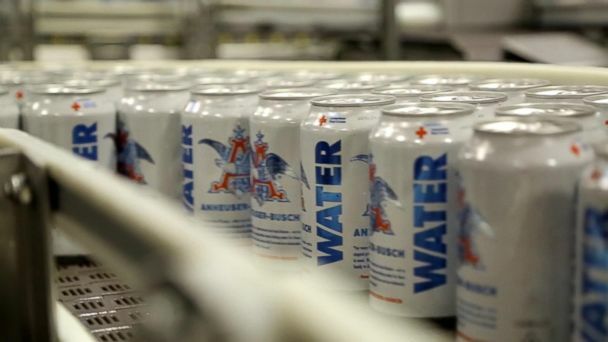 Since 1988, the company has teamed up with the American Red Cross. Sixteen people died in Florida and 12 of those deaths were in Bay County. President Trump praised the federal response but six days after the storm ravaged Florida's Panhandle, some residents are still struggling. In Panama City, Florida, a family brought home-cooked meals to those in need as firefighters used tape to build a makeshift flagpole on Mexico Beach. 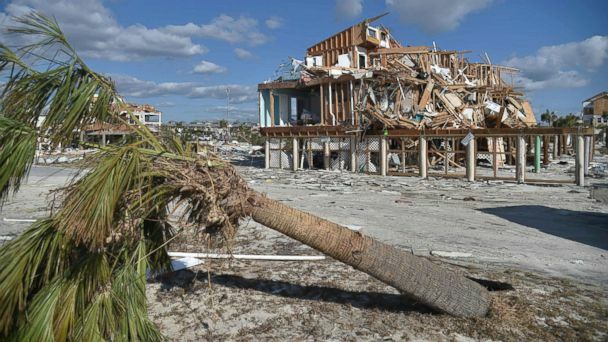 The seaside community of Mexico Beach, Florida, was demolished by Hurricane Michael -- but one family's newly-built concrete home survived virtually untouched. "To see this, personally, is very, very tough," Trump said as he toured a badly damaged neighborhood in Lynn Haven. Gulf Power is attempting to get all 95 percent of its customers who are without power back up and running in 10 days. Jackie Lane of Panama City Beach, Florida, tells how she and her family survived Hurricane Michael even as it destroyed the inn where they rode out the storm. NOAA satellite map helps a woman find her relatives in aftermath of Hurricane Michael. Cadaver dogs continue to search flattened homes in Mexico Beach, Florida for missing people. Amber Gee used the NOAA interactive satellite map and spotted a H-E-L-P message spelled out in logs by her uncle on the lawn of her grandmother's home. With hurricane survivors struggling to find the basics, one group is providing a ray of hope to their neighbors. Crews with search dogs are combing through the debris looking for any signs of life in the mangled piles where homes and buildings once stood. Animal shelter employees describe the danger they endured as the storm made landfall. Michael made landfall on the Florida Panhandle on Wednesday as a historic, Category 4 storm. Michael was the first Category 4 to ever make landfall on the Florida Panhandle. Search-and-rescue teams continue to airlift residents and one hospital said it had finished evacuating all of its patients. 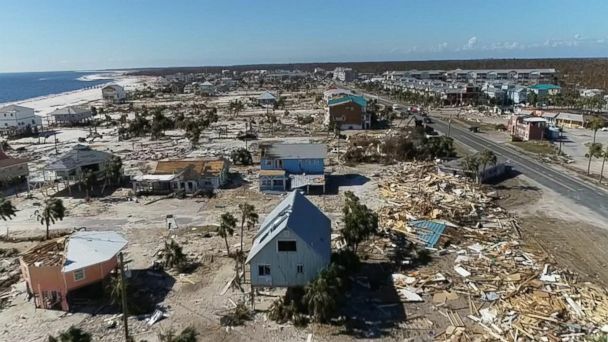 Many areas in Mexico Beach, where the storm made landfall, are just too dangerous for people to return to, officials said. Hurricane Michael struck Tyndall Air Force Base in Florida head on Wednesday, causing extensive destruction to the base and damaged some military aircraft inside hangars. Hurricane Michael's heavy winds knocked down trees, blocking the only road to and from the shelter. ABC Senior Meteorologist Rob Marciano looks at a train that was toppled in the storm. Emergency responders pool their resources to bring help to areas most affected by Hurricane Michael. ABC News' Chief Meterologist Ginger Zee gives eyewitness account of the devastating aftermath of Hurricane Michael in Mexico Beach, FL. At least 8 people have died and millions in six states are without power. ABC News' Maggie Rulli reports. 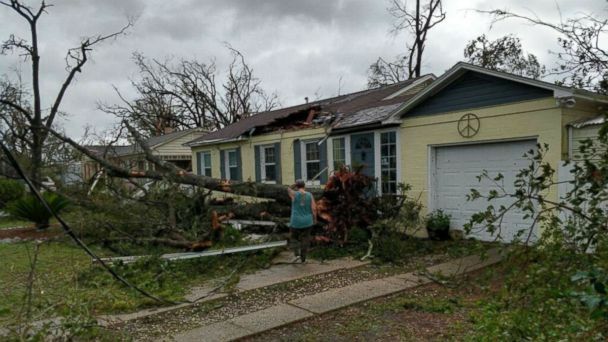 The Category 4 storm left a path of destruction hundreds of miles long across the Florida Panhandle. Mark Bowen, chief of emergency services for Bay County, tells "GMA" how officials are responding to the devastation. ABC News' Rob Marciano reports from Panama City Beach, Florida, with an update on four kittens who fell out of a ceiling collapsing in the storm. The power of the Category 4 storm was evident in dramatic footage that showed demolished homes and submerged neighborhoods in the Florida Panhandle. The historic Category 4 storm, struck the Florida Panhandle early Wednesday afternoon, unleashing heavy rain, high winds and a devastating storm surge. ATF helps coordinate personnel to the region. ABC News captured aerial footage of the scene over Panama City Beach. In the wake of Hurricane Michael's devastation, communities and volunteers are reaching out to help and assist. Heavy winds from historic Hurricane Michael tore through every home on Highway 98.